"Mark Johnson is credited with defeating allegations made against his clients before matters become costly." Mark Johnson maintains a strong, national practice focused on the defense of businesses in consumer class actions. He has relied on more than 30 years of experience to handle more than 80 complex and challenging class actions across the country, mainly defending insurance companies in significant statewide and nationwide class actions. He works closely with the client and his defense team to develop a hands-on approach to class certification, forging creative strategies to defeat class allegations before expensive and time-consuming discovery. Clients come to him not only because of his tactical knowledge of the intricacies of class certification standards and how they can be used to defeat class certification, but also because of his ability to develop a comprehensive strategy that achieves clients’ goals. Mark is ranked by Chambers USA: America’s Leading Lawyers in Business in the area of general commercial litigation and listed in The Best Lawyers in America. 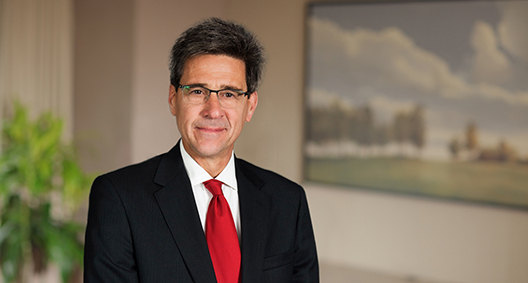 He is a frequent author and presenter at seminars and before industry organizations and trade groups on emerging trends in class actions, and has testified before the Ohio legislature on issues impacting businesses in class actions. Obtained a reversal by the Ohio Supreme Court of a certified class under Rule 23(b)(2) and (3) of more than 100,000 policyholders during a 22-year class period involving windshield repairs. The trendsetting decision advanced fundamental class certification principles. Cullen v. State Farm Mut. Automobile Ins. Co., 137 Ohio St. 3d 373, 2013-Ohio-4733. Obtained a reversal by the Seventh Circuit in a major class action against an insurance company. The district court certified claims for roof damage following a hailstorm that would have compelled the reinspection of thousands of roofs. The court of appeals reversed, applying groundbreaking principles of class certification under Rule 23(b)(2). Kartman v. State Farm, 634 F.3d 883 (7th Cir. 2010), cert. denied 181 L.Ed.2d 138. Obtained affirmance of the dismissal of class claims that the insurer did not comply with the International Residential Code in paying to replace damaged shingles. The Eighth Circuit affirmed the district court’s decision, asserting that the case had been correctly dismissed because the company had complied with policy terms. O’Neal v. State Farm, 630 F.3d 1075 (8th Cir. 2011). Coordinated with other retained counsel for American Family Insurance, in the face of a meritorious dispositive motion on claims based on payment rates under medical payments coverage, to craft nationwide settlement documents of claims pending in an Illinois court to bar claims in an Ohio case, resulting in the case’s dismissal. Mitchell v. American Standard Insurance Co. of Ohio, Summit County, Ohio, C.P. Ct. 2014. Persuaded the court to strike class allegations, prior to class discovery or class certification briefing, for claims relating to the issuance of salvage title, based on the superiority of the available state administrative proceeding. Mathews v. State Farm Mut. Ins. Co., U.S. Dist. Court for South Carolina, Case No. 07-CV-1490. Persuaded the court to deny motion to remand and to dismiss claims prior to class discovery based on the depreciation of labor under homeowners’ structural damage claims as time barred. Doss v. American Family Home Insurance Co., 47 F.Supp.3d 836, 2014 WL 479709 (W.D. Arkansas 2014). Persuaded the plaintiff to dismiss claims before the class certification stage in face of meritorious motion for judgment on the pleadings. Molisee v. American Select Insurance Co., Fayette County, Pennsylvania, C.P. Ct. 2015. Negotiated favorable claims and made settlement to resolve class claims based on the payment of overhead and profit under homeowners’ structural damage claims. Nicholas v. American Modern Home Insurance Co., Miller County, Arkansas, Cir. Ct. 2014. Persuaded the trial court to grant summary judgment for the client before class discovery or certification determination, dismissing claims based on the rate of payment of medical payments coverage claims. That decision was affirmed by the Ohio Supreme Court. Laboy v. Grange Mutual Insurance Co., 144 Ohio St.3d 234 (Ohio 2015). Negotiated favorable claims and made settlement to resolve class claims based on the calculation and collection of premium taxes. Kendrick v. State Farm Mut. Auto Ins. Co., E.D. Kentucky 2014. Persuaded a district court, after removing class claims to federal court, to certify to the Ohio Supreme Court a critical question of state law concerning the enforceability of a medical payments nonduplication clause. The supreme court found the clause to be enforceable, resulting in the dismissal of alleged class claims before consideration of class certification. State Farm v. Grace, 123 Ohio St.3d 471, 2009-Ohio-5934 (2009). Obtained summary judgment before class certification on behalf of the owner of residential apartment communities from claims for recovery of premiums for security deposit insurance, affirmed on appeal. Kopp v. Associated Estates Realty Corp., 2010 Ohio 1690. Persuaded the court prior to class discovery to strike class allegations based on claims for hail damage to roofs. Brunson v. State Farm Fire & Cas. Co., U.S. Dist. Court for the Western District of Tennessee, Case No. 07-CV-2320. Obtained the voluntary dismissal of class claims in the face of a meritorious motion for summary judgment and before class discovery based on use of a Death Master File to identify payees under life insurance policies. Range. v. Cincinnati Life Insurance Co., Cuyahoga County, Ohio, C.P. Ct. 2013. Persuaded a district court to strike class allegations, prior to expensive discovery, of class claims based on the issuance of salvage titles because prior remediation of claims rendered class certification not superior. Thornton v. State Farm, 2006 U.S. Dist. LEXIS 83972 (N.D. Ohio 2006). Persuaded a trial court to grant summary judgment on claims prior to considering class certification. That decision was affirmed by the Ohio Supreme Court on appeal. Bellman v. Am. Int’l Group, 113 Ohio St. 3d 323, 2005-Ohio-5250 (2007). Successfully obtained a reversal in the court of appeals after being engaged after a class was certified that was subsequently reinstated by the Ohio Supreme Court. The class included approximately 1.5 million Ohio policyholders seeking the recovery of uninsured motorist premiums. The trial court later granted summary judgment against the class claims, which was reversed in part by the court of appeals. While on appeal to the supreme court a second time, the class claims were successfully resolved. Baughman v. State Farm Mutual Automobile Ins. Co. (Feb. 9, 1999), 1999 Ohio App. LEXIS 380; Baughman v. State Farm Mutual Automobile Ins. Co., 88 Ohio St.3d 480, 727 N.E.2d 1265 (2000), 2005-Ohio-6980 (2005). Defeated the class certification of mass tort claims arising from an explosion at a petrochemical plant, affirmed on appeal. Currey v. Shell Oil Co., 112 Ohio App. 3d 312 (1996).